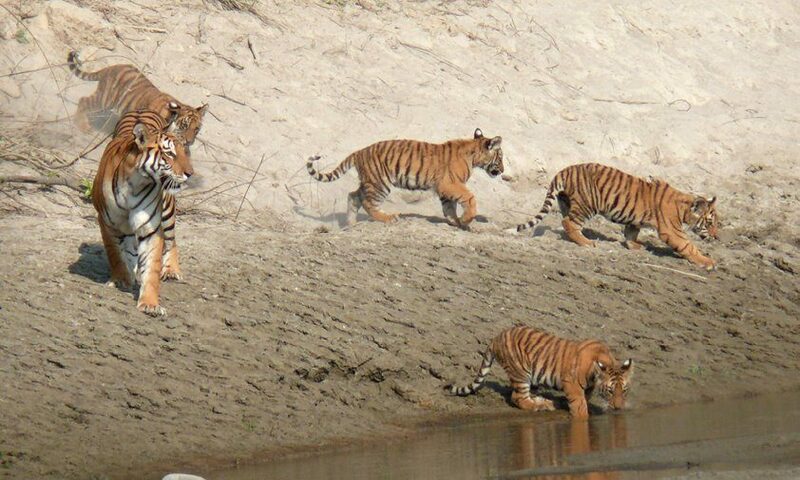 Nepal has taken great strides towards saving tigers from extinction by nearly doubling its population of the big cats in the space of nine years. Local conservation groups welcomed the news, which they saw as a sign that with political will and innovative approaches tigers can be preserved across their range. Officials announced that the tiny Asian nation now has an estimated 235 wild tigers, up from 121 in 2009. This chimes with the target set in 2010 at the St Petersburg tiger summit, which brought together representatives from all 13 countries that are home to tigers. At the summit, nations pledged to double the world’s tiger population by 2022 under a strategy known as the Tx2 goal. “Every tiger counts, for Nepal and for the world,” said Dr Ghana Gurung, WWF-Nepal’s country representative. National tiger surveys were conducted over several months using camera traps and other techniques to estimate total numbers. Nepal has been commended for its commitment to protecting its big cats alongside other endangered animals, such as rhinos, from poaching. Habitat loss and conflict with local people have both been major contributors to the tigers’ decline across Asia, but poaching and the illegal wildlife trade is still by far the biggest threat facing them. Demand for tiger skin, bones and other body parts, driven by their use to make traditional medicines, means criminal networks will pay large amounts of money to those willing to kill them. Across the whole of their range from India to Russia there are thought to be only around 3,900 tigers left in the wild. Conservationists hope the effective policing of national parks and anti-poaching will from politicians in Nepal will set an example to other nations so that significant progress can be made towards the Tx2 goal. “Our commitment to the global tiger recovery programme gains new ground with Nepal’s growing tiger numbers and a successful implementation of Nepal’s tiger conservation action plan,” said Bishwa Nath Oli, secretary of the ministry of forests and environment in Nepal.